I have plenty of vegetable recipes. Some of them are very simple and fast, some of them require some more time. Most of them can be enjoyed during the 21-day purification program, with the exception of the ones that contain eggs, bacon or sheep’s cheese or feta. Wash, trim end and pull of small leaves of artichokes. Add to a big pot with a steamer basket. Add a cup of water. Bring to a boil and let steam for about 45 – 60 min until soft. Serve with your favorite dip. Remove ends of the beans and wash them carefully. Add to a pot with a steamer basket. Add some water and steam for 8 - 10 minutes until tender but not soft. Poor off water and remove beans and basket. Chop 1/3 onion and add to pot with 1 tbs. butter. Bake onion until soft and translucent. Stir beans in the onion/butter mixture and season with pepper and salt. Stir gently. Serve immediately. § Scrub and wash beets, cut off both ends. Cut in a half and slice in thin slices. Put steamer basket in a big pot. Add beets and water. Bring to a boil and steam for 20 min or until beets are soft. Poor out water and add beets back into the pot. Stir in the onions and the vinegar. Serve immediately. § Add broccoli and onion to large baking dish. Sprinkle with salt, pepper and oregano. Drizzle olive oil all over. Roast in 350 degree oven for 35-45min until al dente. Stir once. Serve immediately. Place olive oil, garlic, chili powder and grill seasoning in the bottom of a large bowl and add the broccoli spears. Coat broccoli evenly and place on a large nonstick baking sheet. Roast broccoli until ends are crisp and brown and stalks are just tender, approximately 15 minutes. § Add cauliflower to large baking dish. Sprinkle garlic. Drizzle olive oil all over. Roast in 375 degree oven for 45min until al dente. Stir once. Serve immediately. In a wok, heat the olive oil and stir fry the eggplant, celery and onion for 8-10 minutes. Add remaining ingredients, cover and simmer for 20-25 minutes while stirring occasionally. These eggplant slices will melt in your mouth. Preheat a gas grill to high. Slice eggplant 1/3" to 1/2" thick. In a small bowl, mix together the olive oil, balsamic vinegar, garlic, salt and pepper. Brush both sides of the eggplant slices with the mixture. Place eggplant on the preheated grill. If you wish to have nice grill lines, turn only once on each side. Grill eggplant slices 10 to 14 minutes. § Melt butter in medium pot. Add endives, pepper, salt and nutmeg. Cover and cook on low medium heat for 25min or until soft. Stir a few times. § In a large skillet or wok, heat oil and add onion until soft. Sauté kale, garlic, pepper and salt in batches. Add to a bowl and sprinkle with salt and vinegar and let rest for 30 minutes. In the mean time, chop the onion, garlic and parsley. Wash the tomatoes, cut into pieces and add to a blender. Blend for a few minutes until tomatoes are processed and smooth. In a wide, low pot, heat the oil and bake the onions until translucent. Add the garlic and let bake quickly. Add the tomato juice, salt, pepper and parsley. Arrange the okra in rows in the pot covered by the tomato sauce. Add remaining vinegar. If needed, add some water. Add a small plate to cover and keep the okra in the tomato mixture. Quickly bring to a boil and then let simmer for 30-40 minutes until soft. 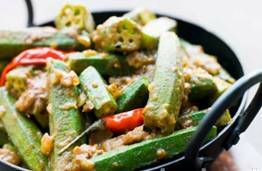 With a slotted spoon, remove the okra and transfer to the bowl. Let the liquid continue to simmer. When reduced and thickened, poor tomato sauce over the okra. Serve immediately. § In a large skillet or wok, heat oil and add onion until soft. Sauté chard, garlic, pepper and salt in batches. § Heat oil in a large skillet. Add bok choy and sauté for 2-3 min, add pepper and salt. Turn and sauté other side for 2-3 min. Move to platter. Sprinkle with tamari sauce and sesame seeds. Serve immediately. § Melt butter in medium pot. Add leeks, pepper, salt and nutmeg. Cover and cook on low medium heat for 20min or until soft. Stir a few times. · Cube 3 lbs. zucchini and steam until just barely tender. · Toss in zucchini and mix well. Transfer mixture to a buttered casserole. Dot the top with 2 tbs. butter. · Bake for 45 minutes or until cooked through and lightly browned in a 350 degree oven. Serves 6-8. § Put on large baking sheet in single layer. Bake 20 min until slightly brown. Stir/turn over once. · Preheat oven to 400F. Poor spinach into small baking dish. Sprinkle with seasonings and stir. Drizzle cream and top with butter flakes. Bake 30min on 400F.